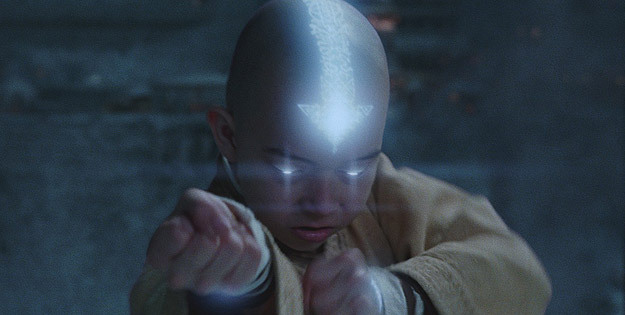 Paramount Pictures has provided us with the full gallery of images from M. Night Shyamalan’s The Last Airbender which you can view here or by clicking on the pic below! Opening in 3D and 2D theaters on July 1st, the big screen adaptation stars Noah Ringer, Nicola Peltz, Jackson Rathbone, Dev Patel, Jessica Jade Andres, Aasif Mandvi, Shaun Toub, Cliff Curtis and Keong Sim. In the film, Air, Water, Earth and Fire are four nations tied by destiny when the Fire Nation launches a brutal war against the others. A century has passed with no hope in sight to change the path of this destruction. Caught between combat and courage, Aang (Ringer) discovers he is the lone Avatar with the power to manipulate all four elements. Aang teams with Katara (Peltz), a Waterbender, and her brother, Sokka (Rathbone), to restore balance to their war-torn world.